This is a self-guided tour featuring seven gardens in Mount Rainier, Brentwood and Hyattsville. CLICK HERE for more information and tour locations. The Mount Rainier Tree Commission is a group of volunteers charged with helping the city of Mount Rainier, Maryland protect and develop its tree canopy. The Tree Commission advises city staff and council on decisions regarding planting and maintenance of city-owned trees. The Tree Commission has no authority over trees on private property, but commission members may advise property owners regarding tree planting, maintenance and removal, at the request of the property owner. Current Tree Commission members are Gabe Popkin (acting chair), MaryLee Haughwout (green team liaison), Bryan Reisz, Barry Stahl, Rebecca Christopher and Gorav Seth (webmaster). Please email trees@20712.org if you're interested in getting involved with the Tree Commission. Mount Rainier Public Works, 3715 Wells Ave.
All Mount Rainier residents are invited to attend. If you are planning to attend, we suggest emailing trees@20712.org ahead of time for any last-minute changes or cancellations. We learned the basic methods of structural tree pruning, which is essential to giving young trees good form and setting them on a path to a long, healthy life. The workshop was led by Barry Stahl, tree commissioner and former National Park Service horticulturalist. Missed the workshop? We wrote up a handy guide you can use for pruning trees in your yard! The tree commission celebrated Arbor Day and planted 25 new trees in Mount Rainier! 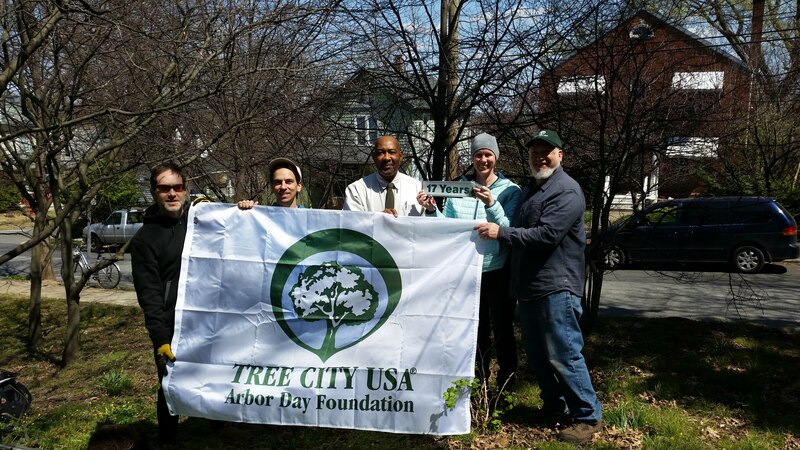 We greatly appreciate Maryland state forester Horace Henry coming by to present the Arbor Day proclamation and pose with us and this awesome flag. Tree City USA for 17 years and counting! Left to right: Bryan Reisz, Gabe Popkin, Horace Henry, Amy Dona, Barry Stahl. In celebration of Arbor Day, tree commissioners, volunteers, public works staff and council members planted 15 trees along streets and in parks. Please enjoy your new trees, and if you live near one, email trees@20712.org to find out about how you can help water them through the hot, dry summer! On January 28, 2017 the Tree Commission held a tree pruning workshop and approximately 10 people attended, including city council members, tree commissioners, residents, and public works staff. The workshop was led by master gardener and tree commissioner Barry Stahl. The training focused on the right time to prune trees and pruning techniques, and participants were able to practice on several Mount Rainier street trees. Mount Rainier roadside tree care expert Jessica Love practices pruning, as tree commissioners Barry Stahl and Amy Dona, and councilmember Bryan Knedler, look on. On May 7, 2016, members of the Mount Rainier Tree Commission, city council member/roadside tree care expert Bryan Knedler and other community members planted two flowering dogwoods at Spring Park (33rd and Shepherd Streets) and tree redbuds in street tree boxes around town. This added to seven oaks and redbuds that were planted last weekend, and 25 more oaks, redbuds and dogwoods that will be planted soon. Enjoy your new arboreal neighbors! In May 2015, city council member and roadside tree care expert Bryan Knedler oversaw the planting of 63 trees in our city. After spending the day overseeing the planting, Knedler reports: “I am exhausted and didn’t even do any of the manual labor! You’ll see new trees around city hall, the Kaywood section of Varnum St, on Perry St at the Brentwood border, and other scattered spots. Most trees planted are native to the area." Click here to view an online list of all street trees in Mount Rainier. This inventory is continually being updated. Click here to send us updated information about any tree in the city. Click here to see information on a recent tour of Mount Rainier's trees. Click here to download a tree permit application, required for removing, substantially pruning or taking any action that could impact a tree larger than 18 inches in diameter, even if it is on your property. To submit a question or comment, email trees@20712.org. Please keep in mind that the Tree Commission is an all-volunteer group, and is not always able to respond to requests for immediate information or action. If a response to your query is needed, we will try to provide one in a timely manner.